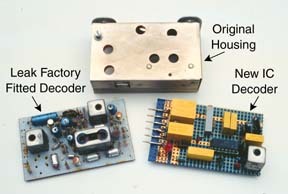 The original stereo decoder supplied by Leak fitted to the "Trough Line Stereo", or factory retrofitted to the "Trough-Line II" or "Trough-Line 3" can be much improved on by using a modern integrated circuit to perform the function. It is recommended that the original decoder be replaced. The original circuit uses just 3 transistors to perform the demultiplexing. Two of these transistors, plus two diodes extract the 19kHz pilot tone on stereo transmissions, and generate a local 38kHz signal. The technique used relies on an L/C resonant circuit at 19kHz followed by full-wave rectification to double the frequency. A single transistor acts as a demodulator and matrix decoder. The design is clever in that it uses very few components, however it was found that the stereo decoding performance is not good. In particular, the 38kHz signal has a considerable amount of jitter present on it - it can be modulated by signals present in the programme material. This causes annoying, easily heard distortions in the stereo output. A replacement circuit for the decoder was designed and built using the National Semiconductor LM1800 integrated circuit. It was possible to build this on Eurocard matrix board and fit it inside the sheilded box of the original decoder. In addition, the "stereo-LED" was arranged to be visible through an existing hole in the box (or this could be mounted in the dial scale if preferred). The edge connector pins from the original Leak circuit board were removed and used on the new circuit board so that it plugged into place in the same manner as the original board. The circuit diagram follows that recommended by National, with some additional components to provide power using the 6.3V filament supply. The decoder circuit requires one inductor which forms part of a tuned circuit that is resonant at 19kHz. The inductor used in the new circuit was removed from the circuit board of the original Leak circuit. The time constant of the phase-locked-loop was made considerably larger than that recommended by National. This reduces the jitter present in the 38kHz signal generated by the chip, but tends to make the time taken to lock on to a stereo sub-carrier signal longer. The two 47uF back-to-back capacitors in the circuit can be reduced in size if a shorter time constant is required. The Natuional Semiconductor IC used above appears to now be hard to obtain. Motorola also make a suitable IC, but it would be necessary to use their application notes to construct a suitable decoder. H. J. LEAK & CO. LTD.